Synopsis: With original stories by Jeffrey Ford, Pat Cadigan, Elizabeth Bear, Margo Lanagan, and others. The Book: Let me start by saying that I am a HUGE fan of Ellen Datlow. I’ve never given a second thought to picking up anything she has edited as I know it will be an enjoyable read. She edits anthologies and short story collections which I love. 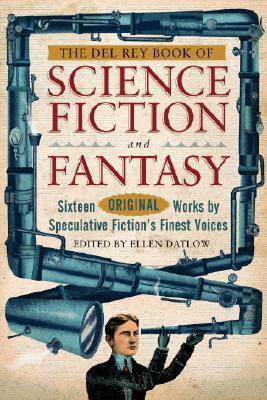 This is a collection billed as science fiction and fantasy written by speculative fiction writers. It is pure speculative fiction in my opinion, which is fine but not what I was expecting. This may have been one of the reason I didn’t really like this book. While I do enjoy being surprised when a story being something other than what I thought it was, speculative fiction takes a bit of work to read and often seems to make no sense. It kind of goes in the WTF category when sci-fi, fantasy, and horror don’t fit. I was disappointed with this book for one main reason – I did not like the stories. Period. It was a struggle getting through the entire thing and the one story I did like somewhat was the last one. What I liked: The story I liked was called Prisoners of the Action by Paul J. McAuley and Kim Newman. The story takes place after an alien invasion when much of the world has been decimated by the alien attack. The POTAs as they are called, are kept in a kind of Guantanamo Bay facility. A lawyer is called in to investigate accusations of abuse against the creatures. No one knows what they are exactly. The POTAs are described as blue round blobs stacked in threes, like a snow man would be stacked. They have no obvious organs or apertures other than a small opening filled with what looks like stones. The lawyer witnesses what could be torture but it’s hard to tell as the POTAs don’t react in the way they are expected to. The cast of characters includes a Bible thumping preacher and his Christian Rock singing daughter, a hip hop scientist and our befuddled lawyer. And the POTAs which could be aliens or just blue blobs. What I didn’t like: The rest of the book I skimmed, I’ll be honest. I didn’t connect with any of the other stories and they left me cold. I’m not giving up on Datlow, but I think I’ll be a little more cautious going forward. I have five more of her anthologies queued up and I hope they are as good as her other work. This is hard for me as I get judged quite a bit for this. I really, really love cheesy Sci-fi movies. The kind that star d-list actors and have special effects that have been created by a team of 12 year olds. Sharknado was AMAZING! Sharknado 2 was even better! I only get to indulge my guilty pleasure on weekends when K is at work. Today I’ve settled in for a marathon – last night I watched “Lake Placid Vs. Anaconda” and today have watched “DinoShark” and am in the middle of “RoboShark”. I love the ones that combine some impossible creation, like “Piranaconda” or “Sharktopos”. The movies usually involve some bikini clad someone, or someones, who get eaten along the way by the monster. A hero and a heroine are on hand to save the day, but not until after a lot of hunting and super fake blood and guts. One of my very favorites is “Mega Python Vs. Gatoroid” starring Debbie Gibson and Tiffany, two of the 80’s biggest pop stars (again, dating myself). The cheesier, the better. One of my friends has suggested that I watch “Birdemic”, on Netflix. Apparently you can almost see the strings the birds are held up with! Great cinema there!